While mobile commerce is big in China – one-third of total online shopping in China is done through mobile – Southeast Asia’s mobile commerce is on a faster growth trajectory than the Dragon. Prior to joining aCommerce, I spent three years working in Beijing that included a stint in the ecommerce business of a major PC manufacturer and retailer. That was back in 2009, when ecommerce was starting to take off in China. At that time mobile shopping wasn’t even on consumers’ minds. People shopped on their laptop and desktop computers and mostly during office hours. My BlackBerry could barely load Google Reader let alone access ecommerce sites. But for many in Southeast Asia today, mobile is the first and only way people are accessing the web. While mobile commerce is big in China – one-third of total online shopping in China is done through mobile – Southeast Asia’s mobile commerce is on a faster growth trajectory than the Dragon. According to Google Consumer Barometer, 31% and 21% of users in Malaysia and Vietnam go online strictly via smartphone, compared to only 8% in China. In a MasterCard study, 59% of Chinese respondents made a purchase on mobile in the last three months, ranking China number one across all Asia. This isn’t very surprising because most of China skipped landline adoption and jumped straight into mobile. What is surprising is the fact that Thailand and Indonesia are ranked second and fifth with 51% and 46%, respectively. 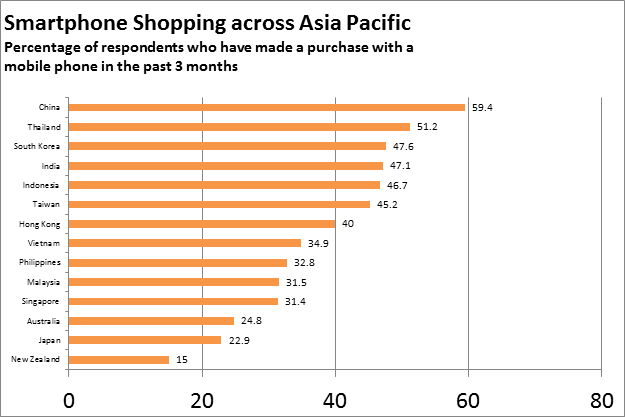 This reinforces the notion that while Southeast Asia’s ecommerce lags behind China’s by several years, their mobile commerce does not. So while we are witnessing a grand leapfrog of mobile potential, LINE’s mobile grocery campaign with aCommerce as a fun example, companies must continue to invest strategically into mobile commerce knowing that it will take off much sooner in Southeast Asia than the 5-6 years it took in China. It won’t reap immediate rewards today in terms of financial ROI but companies won’t regret it when the market hits tipping point 2-3 years from today.